Hi all, I have an 1988 F600, which I unfortunately threw down the road a while back, although she's back on the road, I'v have to take some of the fairing off . Anyway, I found a guy that will help me get her looking like she's straight from the showroom. But I'm toying with the idea of making her a sleeper. That is, R1 forks, yokes, bars, wheel, etc. but I don't want to fork out (excuse the pun.) then find that I cant get the bits to fit. Does anyone know if this is possible, and if it is, can you recommend a rear shock to suit the forks, and possibly a swing arm with a wider back wheel? various parts of other bikes kicking around. I hate to say this, but the FZ600 is not a good bike for throwing all that money into. First off the only good thing about it is handling. The motor is weak with only 2 valves per cylinder and oil cooling. The motor weighs like a boat anchor. The motor in my FZR600 seems to be 70% of the weight of the FZ motor. I myself played with the idea of fuel injection but couldn't find throttle bodies that would fit. Even if you do find them, you need a coolant sensor. Since it's oil cooled, you will have to tap into the oil line. I don't know how accurate it's going to be. If I were you and wanted a faster bike, I would just sell the FZ and buy an FZR600 for an instant 30HP boost or an R6 to double your power. 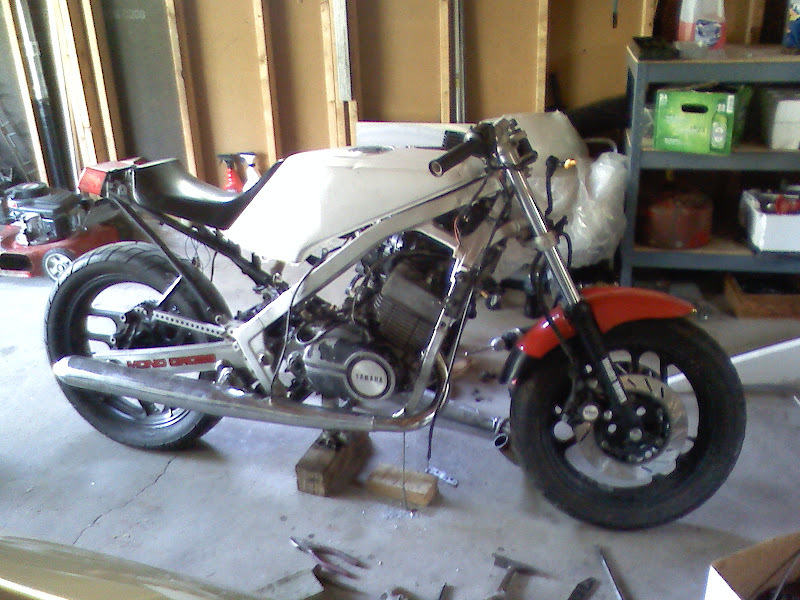 I do however have an fun FZ project. It involves throwing out the original motor and swapping an RD350 2 stroke and make an already excellent handling bike even lighter weight and better. See pic bellow.